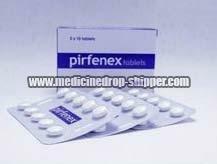 We are counted amongst the distinguished Suppliers and Exporters of Pirfenex Tablets. We carry out our operations from Maharashtra, India. We are backed by a team of medical experts, who meticulously examine each and every lot of these tablets on various parameters, to ensure their authenticity and effectiveness. We have a great reputation for making timely deliveries of our consignments. We offer our Pirfenex Tablets at a highly economical rate. Moreover, to buy Pirfenex in retail or bulk quantities, clients can reach us through our website. Operating from Mumbai (Maharashtra, India), we are catering to clients across India and abroad.